Welcome to DPS 7-05. We recently returned from our 4th spring visit to South Texas after a great safari week with some very happy participants who got the bird photo opportunities they were hoping for and more. As always we enjoyed the hospitality of some of the premier private photo locations in the Southwest, including the hot new property Campos Viejos--1st place winner in this year's Lens and Land photo contest! Every bird photographer knows how difficult it is to photograph woodland birds--especially the colorful ones like warblers and buntings. And for those with either too little mobility or too much sense to race around the woods with a tripod it is usually impossible. That's why I'm always so excited about our trip to the Rio Grande Valley in South Texas each April. Through painstaking construction of photographer friendly blinds several of the ranch owners there have made their properties a bird photographers' paradise. With the use of water features and steady feeding the birds--both local and migrants--are drawn in to where it is possible to get great shots of literally dozens of species that are not only hard to see elsewhere in the US but nearly impossible to photograph. This April was another great experience for our group. We always keep our groups very small so there is plenty of time for individual instruction. This year we had five participants and my daughter Annie who was assisting with the food and logistics and myself. The slideshow at the end of the week was a testament to everyone's success, as were their very positive comments. For our small group trips we focus on some of the premium private ranches which are only available to groups on a guided basis. That helps ensure that the result is a unique experience for the participants and plenty of excellent photo opportunities. We spent enough time on each property so that everyone got to try a variety of blinds including both baited Raptor blinds and the more traditional "songbird" blinds with water and birdseed to attract a large variety of birds in from the desert. One of this year's highlights was the variety of Buntings we were able to photograph. 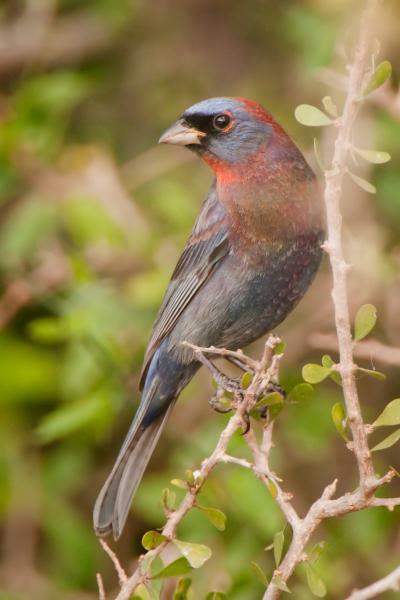 In addition to the beautiful Indigo and Painted Buntings we were treated to excellent opportunities with a Varied Bunting two days in a row. The Buntings complemented the many good opportunities we had with local specialty species including Greater Roadrunner, Green Jay, Scaled (Blue) Quail, Bobwhite, and of course Northern Cardinal and the hard to find Pyrrhuloxia. As always we had a great group of participants. Rhodes & Sarah from Florida were already avid birders and involved in environmental projects at home. Larry & Debbie from Texas spend a lot of their time photographing underwater, so birds were a great change of pace for them. And Michael was happy to get out of the office for a week and savored every minute of the beautiful Texas desert country and the wildlife we found there. In addition to plenty of instruction in the field we had classroom sessions at lunchtime on Digital Workflow, Using Photoshop to improve your Bird Photos and how to make a professional quality book of your trip or photo safari. In the evening we had some entertaining slideshows of Africa, Southeast Asia, and of course a showcase of the participants best images from the week on our final night. 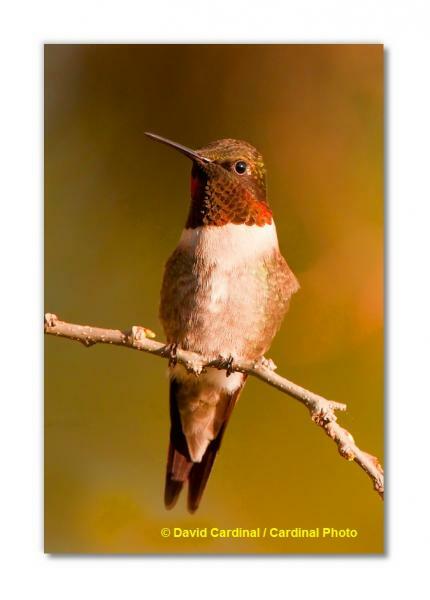 The workshop was full of little tips on bird photography, like the ones we published on Hummingbird Photography 101 and a tip for Upgrading your Backyard Feeder into a Bird Photo Studio. So we're excited to announce that we'll be returning to the Rio Grande Valley for our 5th straight year next year, with our South Texas Bird Photo Safari from April 18th to April 24th, 2010. It's not to early to learn more or sign up now! We've posted a slideshow of some of our favorite images from the trip, and you can read some comments from participants this year and prior years on our guestbook page. Like most wild areas, though, the birds may be numerous but they are hard to find. 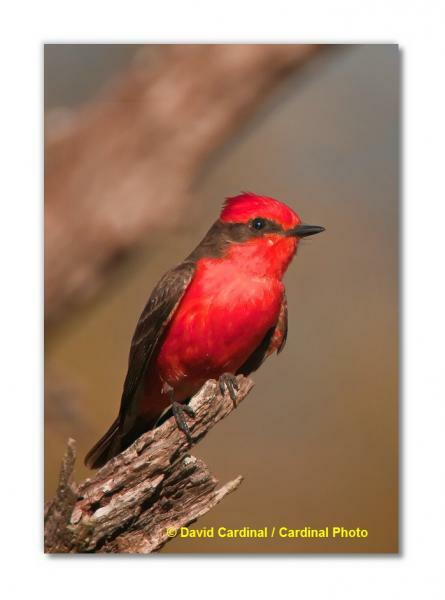 Wandering around the parks there might be okay for birders with spotting scopes, but to get photographs of some of their local specialties like the Vermillion Flycatcher, the Green Kingfisher or even the many Indigo and Painted Buntings it helps to have the reliable surroundings of well designed bird blinds coupled with consistent and effective feeding and watering stations. Fortunately for those of us eager to capture images of these hard to find birds and the many other species of birds that make their home in South Texas there are well developed bird photographer friendly ranch properties in the Hill Country. I'm so thrilled with the photo successes I've had there that I'm delighted to announce that starting next year I'll be able to share them with people through a Hill Country Bird Photo Safari. I'm partnering with the unique Block Creek Natural Area and we're offering a one of a kind Hill Country experience in April, 2010. In addition to the world class bird photography we'll stay right there on the ranches which have been in the family for generations and are still part of a group of working ranches. Picturesque accommodations will include a creek-side cabin, a restored railroad caboose and a renovated historic cabin. We'll have home-cooked and local meals including a chuck wagon dinner. The local beauty makes this trip unusually flexible compared to many other Texas photo safaris. We'll have opportunities for scenics, macro and reptile photography in addition to the birds. 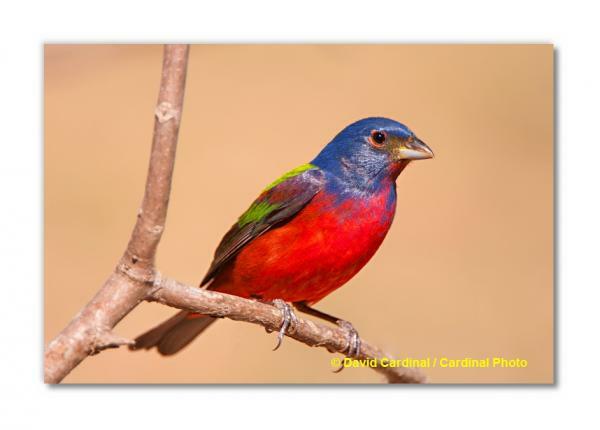 So we're excited to announce our first ever Texas Hill Country Bird Photo Safari & Workshop from April 25th to May 1st, 2010. It's not to early to learn more or sign up now! Special bonus for enthusiasts! If you sign up for both my Rio Grande Valley Photo Safari & Workshop (April 18-24) and the Hill Country Safari & Workshop (April 25-May 1), I'll give you a $200 additional discount and a ride up from the Rio Grande Valley to the Hill Country. Then you'll get two full weeks of world class bird photography on many different and unique private, guided ranches in a variety of habitats and plenty of personal instruction to go along with it. All with just a single air trip! As always we'll have a digital projector and screen and will be teaching (optional) sessions on workflow, bird photography and digital image processing techniques as they relate to nature photography. And I'm always available for personal photo instruction, photo critiques and of course everyone is invited to contribute their images to the popular last night slide show. I keep the group to a maximum of 6 photographers so that we all have plenty of time to work together and make the most out of the week. We still have two last minute openings for the first week of our annual Alaska Grizzly Bear & Puffin photo safari the week of July 8-15. The second week is sold out. And we have one opening for a woman / double occupany for our Luxury Botswana African Wildlife Photo Safari in November. Finally there are also still openings for our Southeast Asia Photo Safari to Cambodia and Burma (Myanmar) in December. There is no better time to visit either place. December is the nicest time of year for cooler, dry weather and the Burmese temples are in fine form and not too crowded. Contrary to what sometimes gets mis-reported, it is a both a delightful and easy country to visit. I'm really still getting the hang of how to use the "pointing" feature and of course manual focus is always a little tricky with limited depth of field, but for a first quick experiment I was quite pleased. The accompanying photo was taken with a dark overcast sky hand-held (remember there is no VR with the Lensbaby so I cranked the ISO up to 1100 to make sure I wasn't dealing with any motion blur on my part). I'm quite excited by the very nice blur the background gets and how dramatic the effect can be. I'll be posting more on the Composer and Wide-angle accessory as I get a chance to do more with it. You can purchase theLensbaby The Composer for Canon EF mount Digital SLR Cameras or the Lensbaby The Composer for Nikon F mount Digital SLR Cameras from Amazon for $269. I'll definitely be bringing mine to Texas and Alaska and be posting more images as I learn more abou it. Thanks to newsletter reader and forum contributor Adam Felde for tipping me off to the excellent Thermaltake Sata HDD USB Docking Station. It is a desktop dock which will fit a 2.5" or 3.5" bare SATA hard drive and let you use it as a USB drive on your system. This is incredibly convenient dock is a great solution for testing drives without having to bolt them into an enclosure and for quick backups or other data transfer tasks. Unlike other quick drive connectors this one is well built, does a great job with hot-swapping, and provides enough cooling that so far I haven't had any issues even with 1TB drives plugged into it. Pro Shooters has released DigitalPro for Windows 5.0.12, including an update to the unique keyword filtering capability which provides the fastest way to add keywords to your images.